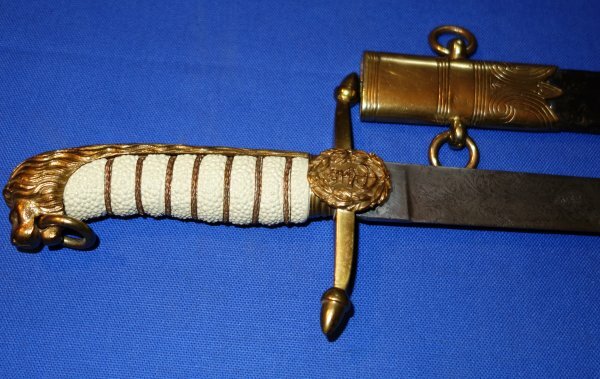 In good to very good condition, a Victorian 1879 Pattern British Royal Navy midshipman's (junior officer's) dirk. A lovely looking dirk, possibly refurbished as the gilt to the hilt is good, and the fishskin is (quality) faux. 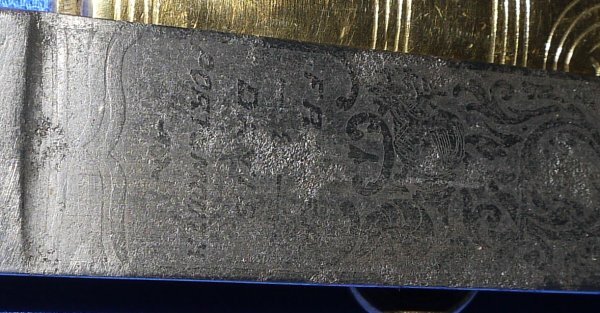 The 17 1/4 inch blade has now feint etching but is firm in the hilt. The hilt and grip are all good, a slight movement of one lesser strand of twisted grip wire; nothing much. The leather and gilt metal scabbard / sheath is good though the leather is a little weak and aged. The dirk sheathes and draws well, the locking pin mechanism works. A well above average example and yours for £? (too late, now sold). Please quote item reference O54 (1367). Further / full sized images upon request.